On this page I'll be talking about the differences between the two different types of head. Now, before I start, get this straight - I don't hate V-8's! I really do like the sound and power delivery of them a lot, but I hope that after reading this page you'll agree how inefficient the push-rod two-valve versions are. The other reason I wanted to write this page is because of the events of the last few years in my car club. The vast majority of the Sports 1300 drivers were in favour of shifting to a modern twin cam 1300cc engine, but there was a rather vocal minority that refused to listen to common sense. I believe that part of their problem was that they just don't understand the benefits of a modern engine, and so were (and some still are, unfortunately) against the change. I have also noticed that there is a general wide-spread ignorance (in the purest, non offensive meaning of the word) of twin cams. They are often perceived as merely 'four cylinder things that you have to rev to get any performance', and so are inferior to a big V-8. Eg, I was talking to a friend about how much power each of us had at the back wheels, and when I mentioned how much I had, he replied, "not bad for a four cylinder." I was rather surprised, as what does the number of cylinders have to do with the power output? I mean, what's the point of calling a 2 litre engine 'weak kneed compared to a 5 litre V-8'? Well, obviously it's going to have a lot less power, as it only about 40% of the size. But does it have only 40% of the power? About the best 2 litre engine around, the Honda S2000 's V-Tec engine, makes a genuine 240hp. About the best 5 litre push-rod engine you can get from the factory makes around 315hp. That's only 31% more hp for 150% more capacity! What if the Honda engine was stretched out to 5 litres? Well, at 120hp per litre, a 5 litre engine would make up around 600hp. So why don't we see any 600hp V-8's for sale from the factories? - Revs, and why small engines rev hard. - Friction in the valve system(s). - The differences in the requirements for the valve springs, etc. Revs, and why small engines (can) rev hard. So which one is working harder? One good way to compare two completely different engines like this is to use the 'piston feet per minute' formula. (The formula is based on crank stroke, etc) With modern metallurgy, the bottom end of any engine can take a good 4,000 ft/min. With the 4AGE at up to 8,200rpm for the last model, the piston speed is a little over 4,000 ft/min, and so this engine is up near the safe limit. This doesn't mean that it's in any danger of throwing a con-rod out the side of the block though - All it means is that the engine is being used to its full potential with regard to revs. The Ford 302 has almost the same stroke, but only does about 2/3's - 3/4's of the revs, and so the piston speed is also only about 2/3's - 3/4's of the 4AGE's. So why don't we see 302's running happily up near 8,000 rpm all the time? It's the valve gear that limits them every time, and because of this they are held back a huge amount. I'll talk about this more in the valve spring requirements. If you have a look at all the red-lines for the majority of modern twin cam engines, they typically have the red-line so that the piston speed is close to 4,000 ft/min. This of course not only means small capacity fours, but the larger sixes as well, eg, the Nissan GTR Skyline, with it's 2.6 litre 6 pot that red-lines up near 8,000 rpm. I guess at this point I should mention the Honda S2000 V-Tec again - It's red-lined at a very high 9,000 rpm, and what's even more amazing is that even with such a high red-line the engine still has a relatively long stroke, (90 mm) giving a piston speed of around 5,300 ft/min. So why can't non-twin cam engines be made to spin to their full potential? The best is the can-on-bucket twin cam, which has great advantages over all other types. I'll talk about why a little later on. 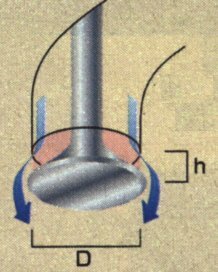 Friction in the valve system(s). In a modern twin cam, you have four camshaft lobes running on four 'buckets' that sit on top of the valves to open them. This means that you'll have twice as much friction (of the cam lobes working the valve system) compared to a two valve. You also have a lot more camshaft bearings that cause a bit of friction - 10 in a four cylinder, verses 5 in the usual single cam. So, not looking too good so far for the twin cam boys. - They all (apart from a bucket type Golf, etc) have rockers or followers of some sort. This means that as the valve opens and closes the top of the valve stem is pushed and pulled from side to side as the rocker tip moves through it's arc. This not only causes friction, but also causes the valve guides to wear out. - The rocker itself has to pivot on something, thus also causing friction. - If the rocker is actuated by a push-rod, then there is further friction between the tip of the push-rod and the rocker. - The push-rod has to be moved by a cam follower, but there is little friction between these two, fortunately. However, the cam follower has to move up & down in a small 'bore' of it's own. The cam does a pretty good job of pushing the follower sideways though, causing yet more friction. 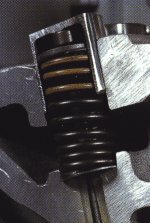 - The cam follower works on the camshaft, causing quite a lot more friction than a twin cam - The reason for this is because the rocker system invariably has a multiplication ratio, usually 1.5:1, so to move the valve the same amount for a push-rod Vs a twin cam, the cam lobe has smaller lift, but has to push against a much higher valve spring pressure (I'll talk about valve spring pressures later) with the rocker ratio working against it. So, suddenly the twin cam is looking a heck of a lot better. If I had to make an educated guess as to how much more power you'd get from a twin cam over a push-rod type - purely with regard to friction of the valve system only and disregarding the breathing considerations - I'd guess that you'd be around 3% - 5% better off with the twin cam. Another consideration is the extra heat, caused by all the extra friction of a non-twin cam engine, that has to be gotten rid of. You have to have a slightly better water pump, oil pump, bigger radiator, etc. All these things cost power and weight. The differences in the requirements for the valve springs, etc. There is also a huge difference in the spring pressure as the camshaft reaches maximum valve lift - The 4AGE is around the 90 lb mark, while the two valve is up around 200 lbs - 250 lbs. The clever readers will, about here, say that in a twin cam there are twice the number the number of valves, and so the advantage is lost - Partly right, though twice 33 lbs = 66 lbs = a lot less than 80 lbs, and the max lift values at twice 90 lbs = 180 lbs = less than 200 lbs - 250 lbs. Some extreme examples - A Nascar V-8 has the very best quality valve gear that is available for two valve engines, to let them run at up to 9,000rpm. Apart from costing several limbs, their valve gear costs a lot of power - A friend of mine visited the Iskandarian factory in the US a few years ago, and saw a valve gear testing machine. It consisted of a dummy block, with one bank having a head with all the valve gear. The whole thing was configured so that only the one bank was driven and lubricated. (no pistons at all) An electric motor drove the thing, and apparently after the test started it took only 30 seconds or so before my friend couldn't put his hand on the rocker cover, due to the heat that the rockers & valve springs created. He also said that the noise was deafening, and that a 20hp electric motor was needed to drive the dummy engine at high revs. The rocker cover had a window in it so that the valve gear could be examined in operation, and after less than a minute the valve springs were glowing bright red! This means a seat pressure in excess of 200 lbs. They make around 650hp, or 130hp per litre. - A typical 2 litre Touring car, used in the 2 litre racing class, uses a ~320hp 2 litre twin cam. The latest engines use a seat pressure of around 35 lbs to run up to the rev limit(ed) 8,500 rpm. They make the 160hp per litre mark. The big reason for all this interest in valve springs is to lead into a talk about inertia. Inertia is the big killer & limiter with valve gear, and so anything you can do to reduce it is good. With a twin cam, there is very little left to get rid of to reduce inertia - The camshaft runs right on top of the valve, with only a lightweight bucket & shim between them. The US Indycar engines run this system, with conventional wire valve springs, and can still run up to around 16,500 rpm so I hope you can see that it is a highly efficient system. At the bottom of the food chain is the push-rod type, which has to open & close the valve via the following - cam follower, push-rod, and rocker. It's possible to get a very good system up to around 11,000 rpm's, but they can be very unreliable. (the push-rods often voice their disapproval by falling apart, frequently poking expensive holes in things on the way) They have all sorts of problems with harmonic vibrations as well. The normal limit is more like 8,500 rpm or so, depending on the size/mass of the valve gear. A SOHC with followers is somewhere in-between a twin cam and a push-rod engine. So, this is one of the big advantages of a twin cam over any two valve engine - The valves are much smaller, and so the valve springs can be so much lighter & smaller. By this simple change, it allows the engine to rev to very high rpm's with great reliability. and as a benefit produce more power due to less inertia and friction. This is the other are where a twin cam has a big advantage over a two valve. Let's compare two engines - A Suzuki Swift GTi 1300cc twin cam and a Toyota 3K, both modified for racing. The Suzuki that I'm talking about is the one in my racing car, and it has a cam with 0.355" lift (9mm) operating on inlet valves 29.5mm diameter. The 3K Corolla engine is the one that I used to race with before I got smart and swapped over to the twin cam; it used 39mm inlets with 0.440" (11.2mm) valve lift. But! -Don't forget that the Suzuki has two inlet valves, so the actual open area is 8.34 x 2 = 16.38²cm, or 22% more. The other advantage of the Suzuki is that the valve spring seat pressure is again less than half that of the 3K Corolla, making it more efficient. So how far would we have to open the Suzuki's valves (which are dead stock, by the way) to make them have the same open area as the 3K? Some caluclations reveal ... only 7.4mm. (0.290", which is co-incidentally the lift I suggested when it came time to pick the 'control' cam that all the Suzuki's in the Sports 1300 class use) Imagine what little power would be needed to work the valves to a mere 7.4mm lift. The valve springs could also be rather 'soft'. How big would the 3K Corolla valves have to be to match the Suzuki's? - 46.5mm. This is a bit of a bother, as the largest valve you can fit into a 3K Corolla with 79 mm (4 mm, or 0.160" overbore) pistons is 39mm. Maybe 40mm, but no way at all could you fit valves of 46mm odd size into the head. Ok, what about more lift then? - 13.4mm. (0.527") That's more likely, but you'd have a great deal of trouble with the valves hitting the pistons, and the valve gear would be terribly unreliable, too. More on these two engines a little later. How about another bit of comparing - The new 4AFE that I'm building for my Starlet. It's got the 'big valve' set in the head, which means 32.5mm inlets, (1.28") and I'll also be using a cam with 0.420" (10.67mm) lift. This works out to an open area of 21.8²cm. Lets put it up against a small block V-8, with 2" (50.8mm) inlet valves. To get the same amount of open area as my 'little' 1.6 litre engine, the bent eight would have to open the inlets 12.97mm (0.510") Whilst 0.510" lift isn't a huge for a V-8, it isn't exactly a little or even medium either. I hope you get the idea as to how well pairs of valves can do against a single 'monster' valve. And don't forget the loss of power having to open that big valve .... and the cost of inertia.